Price: $150 Renewal or $200 First Time Class. Certificate: 2 year ACLS certification cards through the American Heart Association (AHA). Price: $200 Renewal or $215 First Time Class. 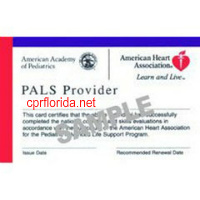 Certificate: 2 year PALS certification card through the American Heart Association (AHA). ALL PALS and ACLS Classes: If you can not find one that fits your needs, email us: info@cprflorida.net We will accommodate you at a higher fee!